What's a Wade Saddle and Why is it so Popular? The Wade saddle has moved from a historical curiosity to an increasingly popular choice, both as a working saddle and a recreational saddle. More and more these days one hears about Wade trees and the Wade saddles. Just what is a Wade saddle and for that matter who was Wade? Well, the Wade saddle is a saddle built on a special tree with it's own distictive shape and features. As far as who Wade was, one would assume that he was the inventor or designer of the original Wade tree, Not true. No one knows who came up with this rather special design. The Wade saddle was popular with that group of cowboys ranchers known as "buckaroos". Buckaroo is the term given to the cowhand who worked cattle in the Northwest, roughly in an area defined by Northern Nevada, Northern California, Oregon, Idaho, and Western Montana. The popularity of the Wade saddle with the buckaroo was largely due to several features - the low seat and low horn made it an excellent saddle to work (rope) cattle from, the deep seat made for a comfortable ride even after many hours in the saddle, and the slick fork (or A-fork) made the rider feel closer to the horse. In addition the position of the stirrups, more or less directly under the seat, promoted an ideal riding posture. Those of us who use a swell fork, found on most western saddles today, would probably be a bit uncomfortable seated behind a slick fork, just as we wouldn't feel all that comfortable if suddenly we were forced to switch to an English saddle. There would be a definite feeling of a loss of the security that the swell fork provides. Argueably, the Wade saddle with it's slick fork design could make better riders of us. 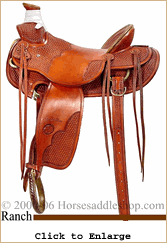 In any event the Wade saddle, though a "working" saddle is gaining in popularity, both on the ranch, on the trail, and for that matter in custom saddle shops, and those who use one probably would not be happy with anything else. Anyway, back to the saddle's history. The Wade design was made popular by two of the greatest horsemen of the 20th century, Tom Dorrance and Ray Hunt. Dorrance discovered the saddle type back in the 1930's. It was owned by a fellow named Wade. Dorrance liked the saddle but decided to make some improvements on the design of the tree and then proceeded to name the finished result a Wade tree and the name stuck. A number of the improved Wade trees were produced over the years. Eventually the tree was introduced to Ray Hunt, the master horseman and trainer whose videos gave me my initial introduction to the essentials of round pen training. It was probably Ray Hunt more than anyone else who was responsible to reintroducing the Wade saddle to the working cowboy and to the western riding public in general. I've yet to try out a Wade Saddle, hope I get the chance some day soon. So it's not something I can recommend as the style you should have. But you might ask around and see what others think. You can find out more by looking at the examples below and going to the Horse Saddle Shop website for even more information.